Feverfew (Tanacetum parthenium) is a member of the daisy family and it makes a wonderful addition to your herbal garden. Not only is is a beautiful plant with tiny white petals and a great big yellow center, it’s great for migraine sufferers. Migraine and headache relief is it’s most common medicinal use, but if offers so much more. Feverfew has been used for ages to relieve headaches, treat stiffness from arthritis, and help with labor and childbirth. Although the name suggests it would work well for fevers, studies have shown it’s not very effective at doing so. Extensive research on the medicinal uses of feverfew were limited until recently, but as more and more people turn to herbalism to treat common ailments, more studies have been done on it’s effects on the body. It’s thought to hinder the production of prostaglandins, the hormone-like substances that cause pain and inflammation. This is why it’s considered effective for treating various types of arthritis. The most notable field of research regarding feverfew, however, is in the areas of head pain — migraines, tension headaches, and stress-induced headaches. Despite the fact that it states there are no major safety concerns, I urge you to still practice herbalism safely. Always consult a doctor before providing herbs to children. Also consult a doctor if you are pregnant or on blood thinners. Feverfew can easily be grown from seed. The seeds are easy to find at most garden centers and online retailers. Before you go out to purchase seeds, though, you may want to ask some friends. 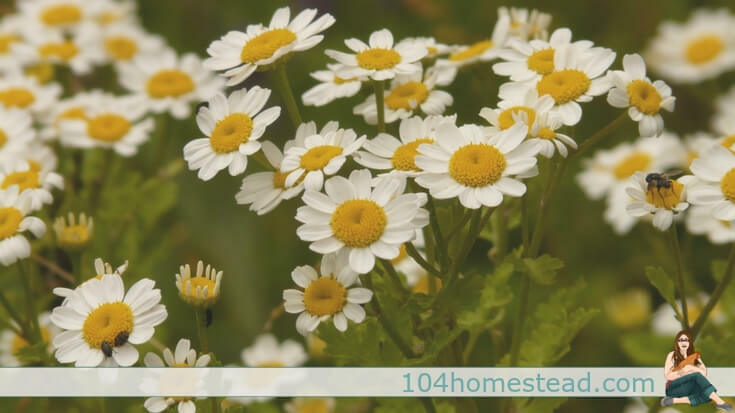 Feverfew can be prolific and you may have friends who are ready to thin their out. Transplant or direct sow in a sunny location. Soil type isn’t much of an issue since this is a hardy and adaptive plant. It’s even suitable in containers. You’ll start to see flowers that very first year, blooming from July to October in most parts of the country. It’s a self-seeding perennial, so cut back to the ground in the fall. Cutting the blossoms from your plants will keep them in bloom for longer. If you’re harvesting for medicinal purposes, harvest the full stems that have open blooms and healthy green leaves. 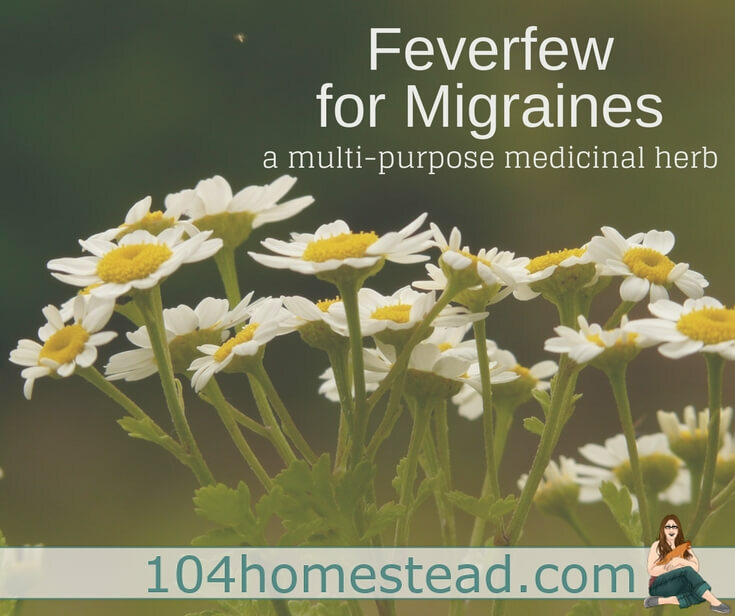 Feverfew for migraines calls for a combination of flowers and leaves. 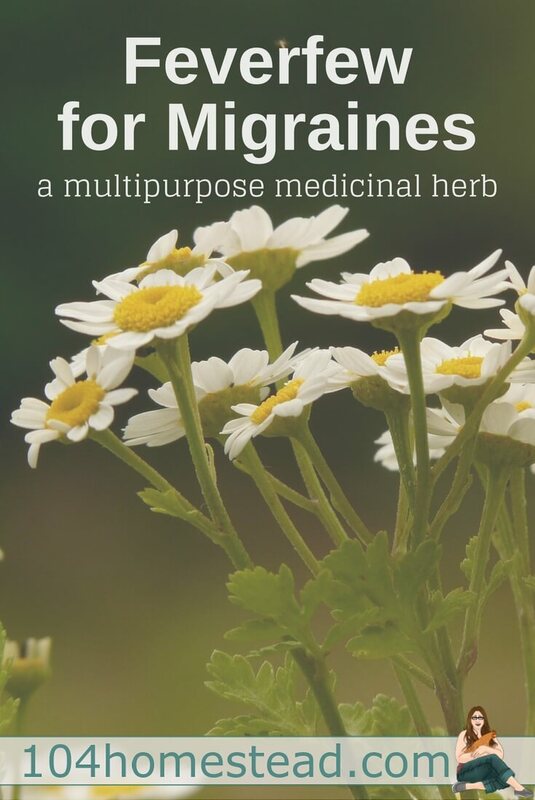 Are you ready to try feverfew for migraines instead of grabbing for Excedrin? A tincture is an easy way to get started. This is the recipe I’ve been using for the last few years and I’ve been really happy with it. Collect lemon balm leaves and a combination of feverfew leaves and blossoms. Wash them thoroughly and chop until they are fine. Add your chopped herbs to your jar and fill the jar with vodka. Your herbs should be 1-2″ below the surface. This is a good time to label your jar with the contents as well as the date. You’ll think you can remember what’s in it and when it was prepared, but life happens. Place your jar on a warm, sunny windowsill. You’ll want to leave it there for four or five weeks, shaking daily. After that time, strain the mixture with a cheesecloth into an amber bottle. You can use clear glass if you prefer, but the amber bottles really do keep your tinctures potent for a longer period of time. 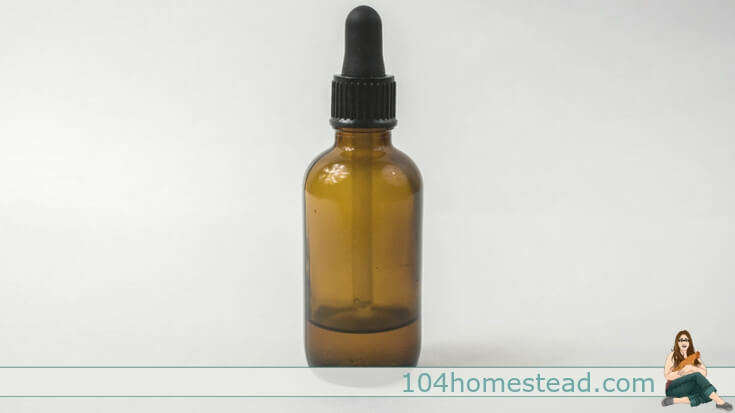 This tincture is good at room temperature for up to 5 years if kept in a cool, dark place. So what do you do with it once it’s sat for several weeks? There’s no further instructions. Good article, I know the effect of flowers and new plants. Yes. How do use it for migraines and for arthritis? Also, should plants be fresh or dry? Tinctures are the easiest way to take it. The lemon balm and feverfew can be fresh or dried. I prefer fresh myself. I’m not familiar enough with those to say for sure. Do you know the latin name? Great article except…How do you use it? I have tons of it this year because last year I got busy with life and my feverfew went to seed and now covers a third of my gadrden area!